On Friday 28th October, scholars, policy-makers, policy advisors and policy practitioners from SPERI, Policy Network, the House of Lords, the European Parliament and the New Economics Foundation amongst others came together in London to participate in a one-day workshop entitled ‘Brexit and new EU economic governance’. 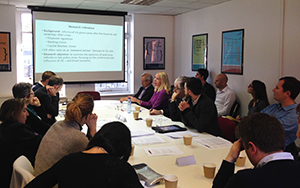 The workshop, organised jointly by SPERI, Policy Network and the Foundation for European Progressive Studies (FEPS), was the second of a series of four Events|News as part of the project ‘Diverging Capitalisms? Britain, the City of London and Europe’. 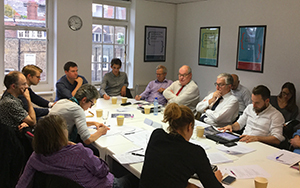 The aim of the project is to consider the changing nature of the British economy, its changing place within the European economic space and potential post-Brexit routes forward. The event’s attendees contemplated the expression of political and economic interests, fragmented internationally and intra-nationally, within the construction of EU economic policy-making in the wake of the global financial crisis, the Eurozone crisis and the UK’s referendum on EU membership. The UK’s evolving relationship with the EU was debated and opinions offered on the kind of deal the UK should seek to secure (and expect to secure) when Article 50 is eventually triggered. Two interactive sessions based on the research of Prof. Lucia Quaglia (University of York) and Dr. Waltraud Schelkle (London School of Economics) were enriched by the contributions of Dr. Aidan Regan (University College Dublin) and Dr. Jeremy Green (University of Cambridge). This was followed by a panel discussion with policy-makers and commentators including Prof. Benedicta Marzinotto (European University Institute, Florence), Prof. Helen Thompson (University of Cambridge), Ernst Stetter (Foundation for European Progressive Studies) and Roger Liddle (Policy Network). The programme for the day is available here. This event was preceded in the Diverging Capitalism series by April’s workshop on ‘The City after the Crisis’, and will be followed by two further workshops in Brussels next year that will focus on: i) the diverging developmental trajectories of British capitalism and European capitalisms; ii) contextualising the Brexit referendum and discussing the findings of the project. If you wish to receive more information about the Diverging Capitalisms project or about forthcoming Events|News, please contact SPERI’s Dr. Daniel Bailey.